With IAS exams coming up, it is essential for students to take the best method in tackling and approaching the IAS exams. The IAS exams are one of the most prestigious exams in the country. Lakhs of students write this prestigious exam every year, in hopes to clear this exam and being applicable for the much more prestigious civil services posts such as the IAS and IPS positions. Positions such as Indian Administrative officer and Indian Police Officer are exclusively reserved for the best of the candidates. A candidate needs to possess the highest mental caliber in order to clear the exams. As these positions are all included in top government positions. It is important to be prepared to the best of one’s abilities for the main exam, However, it can be a lot of stress and pressure to prepare for the exams. We have made it much easier for you to reduce the overall workload and pressure and compiled a small snippet of things to keep in mind before writing the exam. Exam Dates: Remembering the various exam dates is incredibly important as it forms an important part of the UPSC exam details. It is important to know the various exam dates for the exam preliminaries as well as the mains. The UPSC provides the notification containing the various exam dates and candidates should keep this in mind before writing the exams. 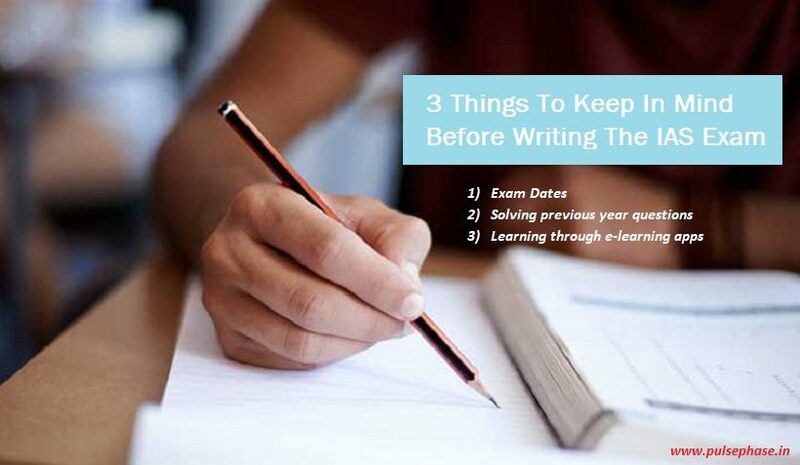 Solving previous year questions: Solving previous year question papers is important as it allows a candidate to understand the previous year exam paper questions and one can similarly know about the IAS exam pattern, to prepare themselves better for the main exams. Learning through e-learning apps: If one learns through e-learning apps they are provided with a lecturer along with tutorials and course material which they can prepare from. Apps like BYJU’s are incredibly useful as they provide candidates with ample amounts of practice through videos and course material.